Primarily made to address the need to send URL links between parties and easily copy & paste them, it's turned into a sort of C.B. Radio. Anyone can join the semi-public channels, but they must know the correct channel name to listen in. Does not work cross-faction. Input text in the box above channel buttons. Enter does not send to chat; instead, you must click the channel you wish to send to. 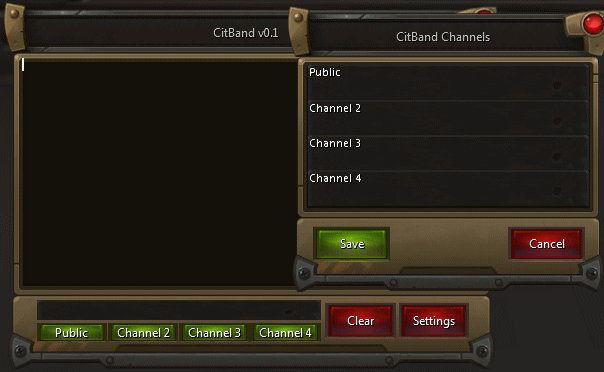 Clear will clear both input and received chat boxes. Hard limit of 4 channels. Caution: Potential for overflow in this initial release; addon runs continuously in the background, listening to channels. If you run into an overflow, please comment below with the copied error text. Thank you.